HCM CITY — Viet Nam’s roads are slowly getting safer, but not for kids, according to experts. High school students are the most likely among adolescents to be killed in traffic accidents due to their “unsafe behaviour on roads”, found researchers from the Vietnamese-German University. Speaking at a workshop on road accidents held yesterday in HCM City, Dr Trịnh Tú Anh, head of Tôn Đức Thắng University’s planning department, said as many as 2,000 adolescents (defined as 10 to 19 years old) were killed on the roads per year. Students in high school (grades 10 through 12) were the most susceptible adolescents in Việt Nam, with nearly 33 road deaths per 100,000 adolescents. The figure is five times higher than the average mortality rate of all ages in the country, or eight to nine times higher than the rate of the same group in developed countries, according to Anh. “The traffic accident rate is decreasing in Việt Nam, but this is not the case for children,” she said. Most of the accidents occurred when students were driving mopeds, bicycles or electric bicycles. Although traffic awareness campaigns had existed in Việt Nam for years, the number of accidents related to adolescents remained high. More than 80 per cent of the accidents occurred when the adolescent was driving, she said. The five most dangerous driving behaviours of adolescents include: changing to the wrong lane (23.6 per cent), going in the wrong direction (11 per cent), speeding (9 per cent), overtaking other vehicles (6.7 per cent) and dangerous street crossings (6.2 per cent). Motorbikes account for more than 90 per cent of total motorised vehicles in Việt Nam, the highest proportion of any ASEAN country. “Seventy per cent of road accidents are related to motorbikes. The main causes include lane violations, speeding and going in the wrong direction,” she said. Dr Khuất Việt Hùng, executive vice chairman of the National Traffic Safety Committee, said the most common traffic violations were speeding, drunk driving, driving in the wrong direction, driving in the wrong lane, talking on the phone while driving and driving side by side. He also noted that drivers were also uncooperative when dealing with traffic police. Traffic education and road safety are not officially part of the education curriculum in Việt Nam. Last year, more than 8,000 people were killed in road accidents. Traffic accidents cause losses of US$5-12 billion per year, while total damage from traffic accidents is expected to be $130 billion for 2015-2030. To address this challenge, co-operation from the State, scientists, businesses and local and international organisations in developing new solutions to the traffic problem is very important, according to Hùng. Việt Nam has targeted reducing traffic accidents and deaths by 5-10 per cent each year by 2021. Hùng said the Law on Road Traffic should be amended and a national database on traffic accidents be created. Vũ Anh Tuấn, director of the Vietnamese-German Transport Research Centre at the Vietnamese-German University, said a comprehensive plan for road safety solutions based on traffic data and evidence was needed. 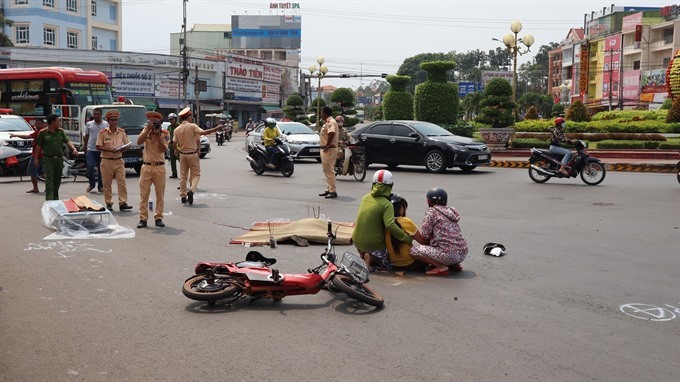 Dr An Minh Ngọc, of the University of Transport and Communications, said Việt Nam lacked sufficient funds to develop road safety measures and solutions. For example, many agencies involved in road safety activities use the same funding sources. Other financial sources could include surcharges on motor fuel, vehicle licensing fees and road tolls, Ngọc said. Under the Việt Nam-Belgium research framework, and with the support of the National Traffic Safety Committee of Việt Nam and Việt Nam’s Traffic Safety Association, a Network of Excellence (NoE) on Traffic Safety for Việt Nam was launched last year.